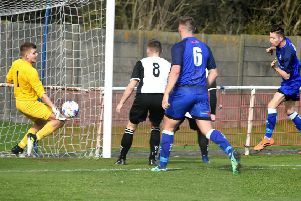 Squires Gate exited the Lancashire Challenge Trophy at the first hurdle as an experimental side lost to their Hallmark Security League rivals. 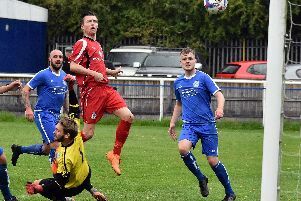 Manager Andy Clarkson handed debuts to keeper Jack Hargreaves, midfielder Jack Webster and striker Danny Squires as he looked to review the progress of his young prospects. Gate started brightly and got in behind the Padiham defence but it was the visitors who took the lead after 13 minutes. Padiham hit Gate on the break and forced Jordan O’Mahoney into a last-ditch tackle which the referee deemed worthy of a penalty. Liam O’Neill fired the spot-kick past Hargreaves. The visitors were awarded a second penalty on the half-hour but this time the debutant keeper guessed right to deny O’Neill a second with a fine save. It remained 1-0 until half-time but Padiham doubled their lead within a minute of the restart. O’Neill ws again the thorn in Gate’s side as he picked up the ball outside the box before firing past Hargreaves with the outside of his boot. There was no way back for Gate, who go back to concentrating on league games. These come thick and fast, with a home fixture against West Didsbury and Chorlton on Saturday. Gate: Haregeaves, O’Mahoney, Rossall, Bamba, Sumner, Jones, Webster, Mullen, Salthouse, Clarkson, Squires. Subs: Fletcher, Seear, Wyers-Roebuck, Charnley, Riley.